Nifty Notions, Rulers, Templates, and More! Hasn’t it been fabulous to enjoy these warm sunny days outside? This is what I was dreaming about all winter when the snow and cold seemed like it would never stop! The upside of a rainy summer day is that it’s the perfect excuse to head back into your sewing room When you do get the time to quilt, you will love having some of these new notions that Nikki just picked up for the store. We’ve got some new rulers, a great new travel iron if you’ll be hitting the road this summer, a few new patterns, and some other cool notions. Read on below for all the juicy details! The products in this newsletter are all new, so for the first week in the store we will be offering most of them at a reduced introductory price. You will not need to enter a discount code to receive these introductory savings and the prices are valid until July 4, 2014 at 9 am, E.S.T. ***Please note that some vendors do not allow us to alter the price of the product. These products will only have one price listed under the image. Cut and sew kites up to a finished size of eight inches. Follow the markings on the ruler to cut the top and side triangles. Line up these odd angles perfectly by marking the seam allowance through the holes in the ruler. Or, cut the kite on the fold to save a sewing step. These 60 degree and 120 degree angles combine with hexies, half hexies, 60 degree triangles and 120 degree triangles for limitless design potential! You can make hearts, flowers, circles, ovals, teardrops, leaves and more. With just these four templates. 2-1/2in Strip Wonky Ruler by Quilt in a Day includes Twisted Log Cabin Pattern. Make your Log Cabin block pop with the twisted flair of Quilt in a Day’s new ruler: 2-1/2in Strip Wonky! Now, cut with ease a fun and wavy block that’s sure to add an electrifying sway to your traditional Log Cabin. This may be the world’s smallest steam iron with a mighty ability to set crisp creases and remove wrinkles. It is strong enough for everyday use at home, yet lightweight and compact for taking along with you. When trying to iron in and around pockets and pleats, the SteamFast SF-717-A with its tiny non-stick soleplate, will get into places bigger irons can’t reach. If you travel, or if you simply need to touch up garments away from home, the SF-717-A Steam Iron is an ideal appliance. It comes with a convenient travel bag, and features a non-stick soleplate, and dual voltage for overseas travel. You can be confident that Steamfast products are built to perform, and are built to last. The fantastic alternative to pins is here! These great clips can be used on virtually any sewing project with virtually any type of fabric. From delicate laces and satins to heavier leathers and furs-they will not damage the fabric or leave unsightly holes. Shape darts; create pleats; pin up hems; whatever you need to do these clips will help! 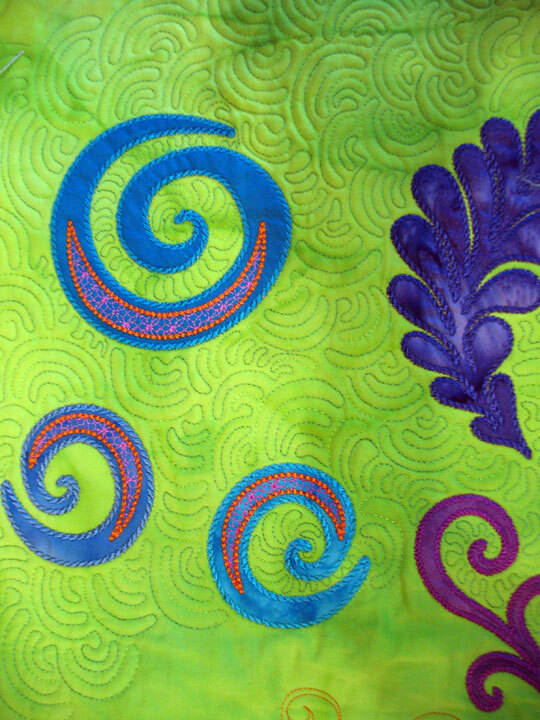 No coil means no place for your delicate fabrics or embellishments to get stuck or frayed. Nickel plated. Make precision cuts for your sewing projects with the Featherweight Dressmaker’s Shears. These sewing shears have a wonderful lightweight design featuring stainless steel blades for sharp and easy cutting. Nylon handles. Birch wood darning egg with convenient handle. Extra-large punch design fits inside a 2″ circle. Add distinctive style to craft projects of all kinds with a Squeeze Punch that makes every embellishment up to 2X easier to punch than other shape punches on the market. A specially engineered squeeze motion with ergonomic handles offers comfortable use, even when you have a lot of shapes to punch. In addition, an open punch head lets the user see where they are punching for a perfect punch every time with no more wasted paper. Our Squeeze Punches even nest for convenient storage. This innovative pattern includes a window valance, place mat, and potholder. Each one features hand embroidered herb blocks. Four different herb designs are included: dill, basil, sage and rosemary. 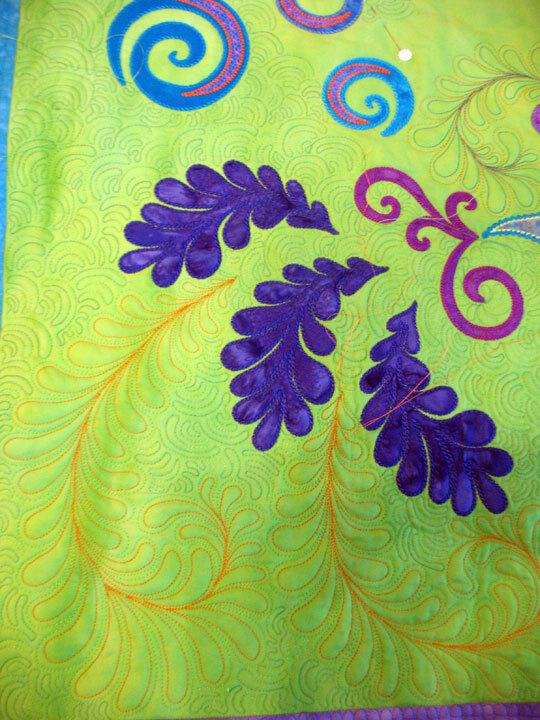 The pattern also includes instructions for the valance panel shown on a 24″ rod. (Multiple panels are needed for wider windows.) Instructions for a place mat and potholder are also included. 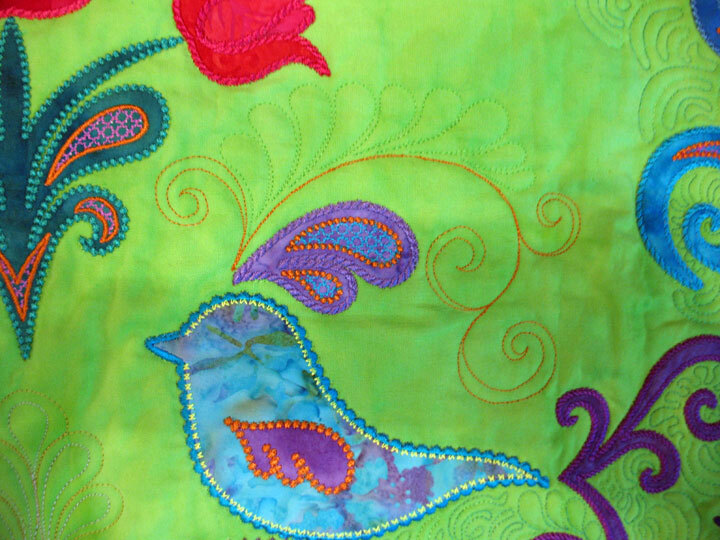 The designs may also be embroidered on an apron, table runner, tablecloth or even pillows. 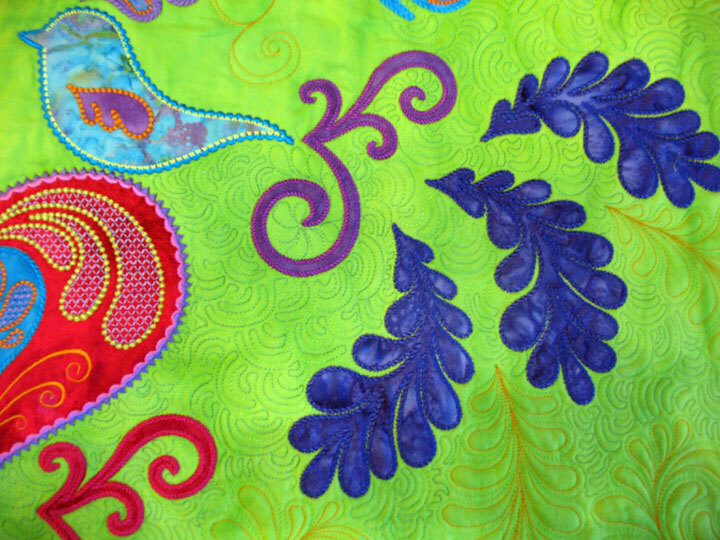 Valdani 12 weight pearl cotton is recommended for the embroidery. 5 Start by making one large “bench pillow” form. Then change out a new cover for that pillow form for each season or holiday! This is the idea behind a new line of patterns for interchangeable bench pillow projects. The “O Canada!” pillow cover is perfect for July or all year long! Instructions for making the pillow form, as well as the “O Canada!” Cover are included. Filed under Site Updates. Comments Off on Nifty Notions, Rulers, Templates, and More! 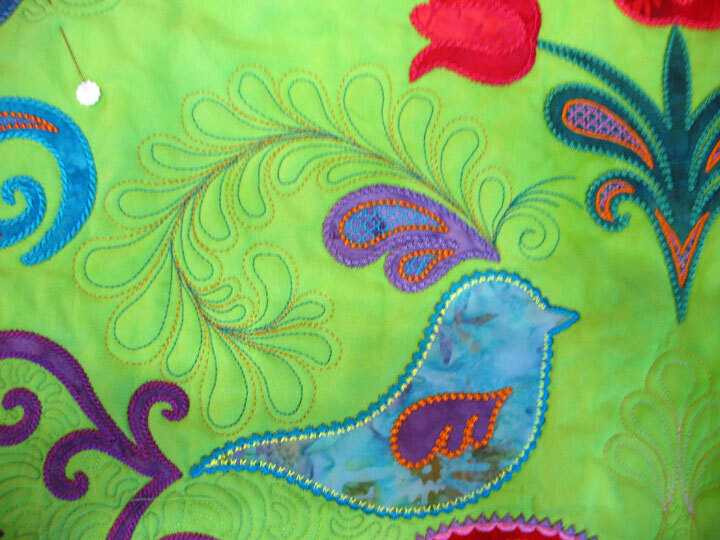 If you’re anywhere near NW Ohio, be sure to check out The Quilt Foundry. It’s a great shop with lots of beautiful fabrics and the staff is so nice and helpful! Thanks for the tip, Lisa! 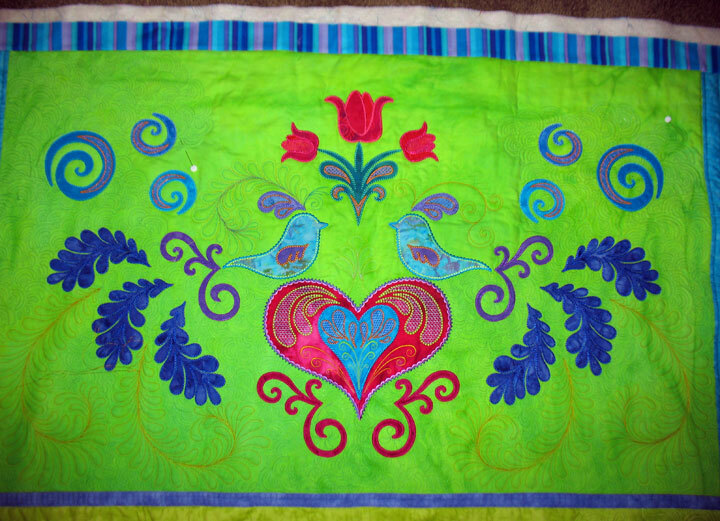 And Now a Quilt With Some Color! If you haven’t tried trapunto, please give it a shot as it is so much easier than you think it will be! 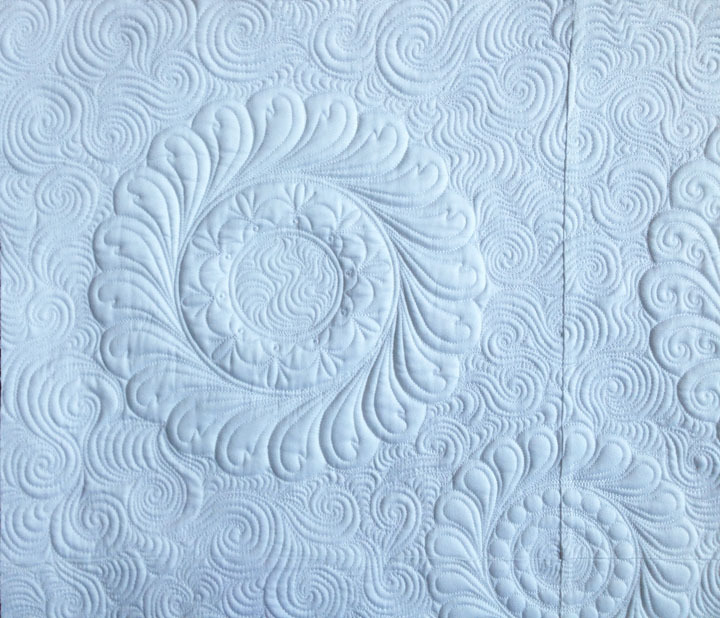 If you haven’t tried quilting part of your quilt with an embroidery machine and then going back in and doing your own freehand work to blend it all together, this is also worth a shot! 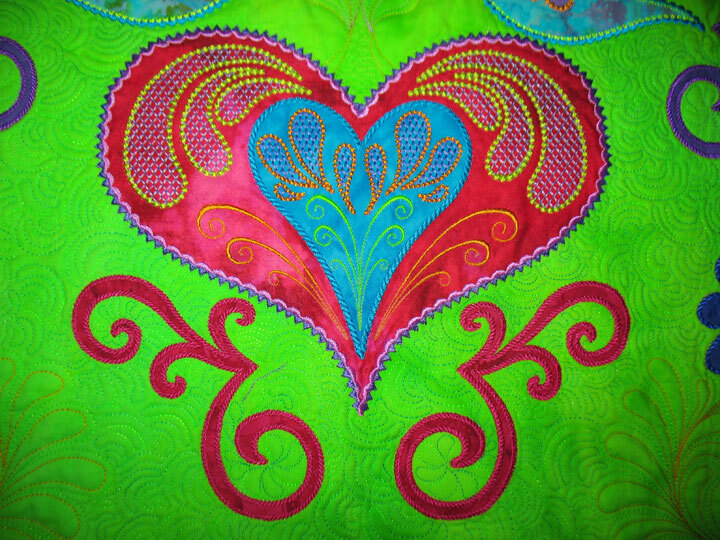 I love, love, love to free motion quilt but this is a blast as well! Both Volume 1 and Volume 2 of Majestic Feathered Wreaths CDs have files for really cool, intricate feathered wreaths, and you can now buy the compilation CD for all the wreath designs together for a great price here. …but when I looked straight forward, I saw pretty much total darkness! The other part of the process that is weird is that you can’t have any lights shining on your quilt as you sew. When you get to be my age, you start amassing all kinds of gadgets by your sewing machine to help light up your visual field. Not only did I not have any of those lights, but they had to cover my machine’s lightbulb as well! What is the class about? I’d love to tell you but then I’d have to kill you! When will it be available? I don’t know! How’s that for being a fountain of information?! Sorry to be so obtuse but I wanted to let you know that it’s coming…sometime!